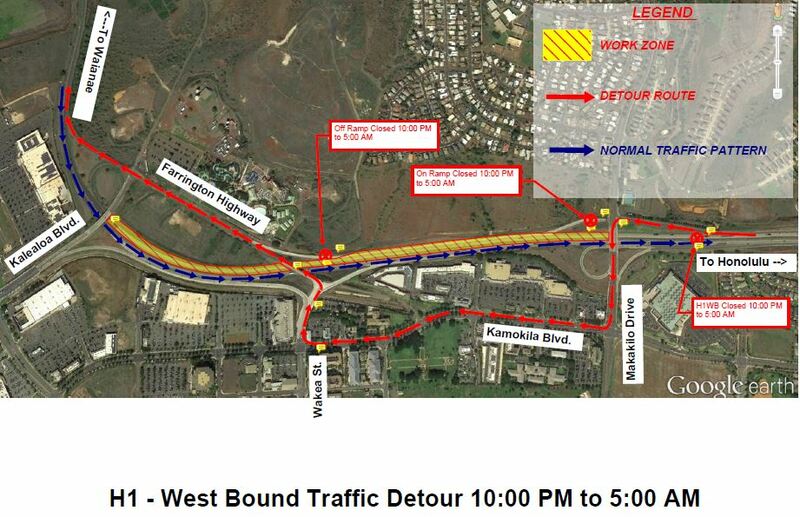 HONOLULU – The Hawaii Department of Transportation (HDOT) notifies Oahu motorists of scheduled closures of the H-1 Freeway in both directions between the Makakilo Drive Overpass and the vicinity of Campbell Industrial Park for the Kapolei Interchange Complex Phase 2 project. Lane closure details are as follows. 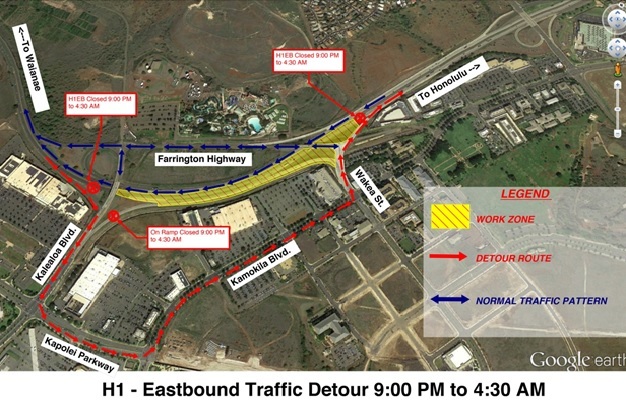 The H-1 Freeway will be closed nightly in the westbound direction between the Makakilo Drive overpass and the Campbell Industrial Park/Barbers Point Harbor offramp (Exit 1) beginning at 10 p.m. Monday, Feb. 4, 2019, and ending 5 a.m. Wednesday, Feb. 6, 2019. The nightly closures are for concrete pours on the roadway leading to the new bridge. The H-1 Freeway will be closed nightly in the eastbound direction between the Campbell Industrial Park offramp (Exit 1) and the Wakea Street onramp on beginning at 9 p.m. Wednesday, Feb. 6, 2019, and ending 4:30 a.m. Friday, Feb. 8, 2019. The nightly closures are for the installation of bridge girders over the eastbound lanes. Westbound motorists will be directed to the Makakilo/Kapolei/Kalaeloa offramp (Exit 2) and may re-enter the H-1 Freeway via the Farrington Highway onramp. Eastbound motorists will be directed to the Campbell Industrial Park/Barbers Point Harbor offramp (Exit 1A) and may re-enter the H-1 Freeway via the Wakea Street onramp. To view a map of the detour routes, please see below. Electronic message boards will be posted to notify motorists of the closure. Special Duty Police Officers will be on-site to assist with traffic control. Emergency vehicles, first responders, and TheBus have been notified of the roadwork and will not be allowed through the work zone. Motorists are advised to allow for extra travel time to get to their destinations and to drive with caution on the detour routes. Roadwork is weather permitting.